Don’t miss this week’s fun Healthy Offer from Savingstar! 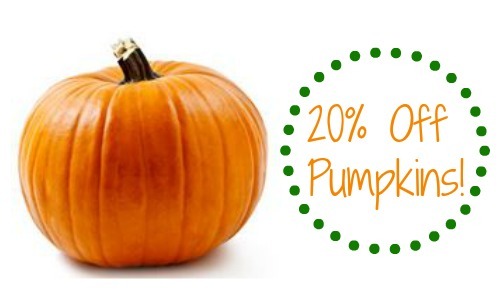 Through 11/3, you can save 20% on any single purchase of loose pumpkins at participating retailers. This is just in time to Fall and the pumpkin season! Whether you buy one to eat or for decoration, don’t miss out. It’s FREE and super simple! This coupon expires on 11/3 and is good for one use only. So use this coupon to grab a discount at a any of the stores SavingStar works with (Bi-Lo, Harris Teeter, Kroger, Food Lion etc.)! Jif Peanut Butter For Only 79¢ Per Jar! 2019 Tax Day Deals and Freebies! Pasta & Garlic Bread, 39¢ each at Publix! Walgreens Balance Rewards – Redeem up to $50 Starting 5/5!